NO NATO! : WAR STARTS HERE, LET'S STOP IT HERE! 2015 Trident Juncture NATO Maneuvers to be held in the Spanish state, particularly in Aragon region, start in October in its most virtual level to test the connectivity between the military command. But on the ground, as are known the maneuvers that use real fire and troop movements (36,000 soldiers acting, 20,000 deployed in the kingdom of Spain, 8,000 members of the Spanish armed forces and an expected huge cost, whose amount "War" Minister Morenés intend to keep hidden), will take place the "real stage" (<<Live Exercise>> or LIVEX) in the Iberic Peninsula and the Balearic Islands from October 24 to November 6. Also, on Wednesday November 4 Zaragoza receives the visit of Secretary General of NATO in what they call "Distinguished Visitors Day", a day specially aimed to have a powerful media effect to legitimize their war preparations. Therefore we anticipate our action plan coordinated with the European Antimilitaristc Network . The maneuvers take place predominantly in the Spanish state, but also in Italy, Portugal and other Atlantic and Mediterranean water locations, where we are also prepare demonstrations around the same times and with which we keep contact. The week when the "real stage" maneuvers begins will be made public the supports, from local, national and international, that may has to that moment the manifest "Call to Action against Trident Junture 2015 maneuvers NATO " that, together, propose Alternativa Antimilitarista.MOC, the Red Antimilitarista y Nonviolenta de Andalucia and the European Antimilitaristic Network. We have planned in Zaragoza a series of activities, workshops, lectures and street actions, to be held from October 24 to November 6 (date of the end of maneuvers on the peninsula). The central movilization in those days will be, therefore, November 4, with a human chain linking the former Military Captaincy of Zaragoza building and the Bank of Spain, a representative institution of the political-financial system that supports the armed organization that call itself NATO. In the route we want to make our protest visible to military of foreign armies that have booked accommodation at nearby hotels for their "Distinguished Visitors Day". During the week of November 3 to 6, at nightfall, we will make several "symbolic actions" (with music, theater or poetry against War) in the Zaragoza Paseo de la Independence street and them some meetings at "La Pantera Rossa" [social center] about "The Maneuvers of the Crisis", " The Dark Side of alliances for war" and "European and the Antimilitaristic Network against capitalistic war preparation: A Brief History of nonviolent direct action, Barbate 2015 ". This last with the participation of international activists who participated, from 30 October to 3 November, along with activists from Zaragoza, in civil disobedience against the maneuvers actions. Previously, two weeks before, we plan to open to collaboration the preparation of the "artivists" activities, from an anti-militarist lanterns making workshop to "Theatre of the oppressed" workshop (which will be perform during one of the street actions), and another one about security entitled "NATO is watching you, protect yourself." It is possible that we also count on the presence of Stasha Zajovic in Zaragoza, 'Women in Black' activist against the war in Belgrade, which will remind us the consequences of the military alliance actions, and the rest of other equally criminal armies, in the Balkans. Will help to keep newly present the analyzes, experiences and activities of the anti-militarist feminism (international court of women, the anniversary of Srebrenica ...) as well as its proposals: <<Let's expel war from history and our lives>>." 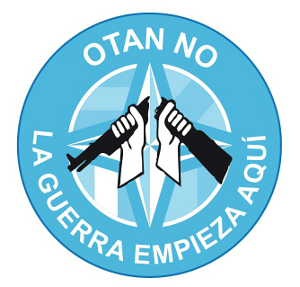 Meanwhile, next Saturday October 3rd, the Anti-NATO Zaragoza Platform calls for demonstration "against NATO and its maneuvers" starting from Plaza Sasera at 12pm. 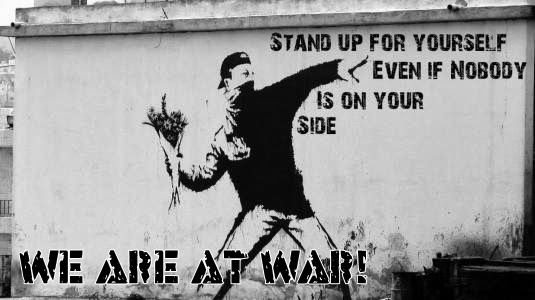 Because war is a crime against humanity and who obeys holds the boss, join the Antimilitaristic Disobedience for Peace and Justice in the Planet.